As mentioned before in many of my blogs, Ray is a Yarn Hound. I don't think I've knit anything since I brought him home, it's just too dicey. But this Christmas my BFF, Joanne, and her husband, Mark, made me a really useful present. If you can't read the label, it is a C.R.Y.P.S. A Counter-Ray Yarn Protection System (patent pending). The system (nut container) sports a picture of the Yarn Hound holding a bag with yarn and needles in it (clevely photoshopped from a photo that appeared in the blog last year.) The lid has a hole in it, through which runs the yarn. 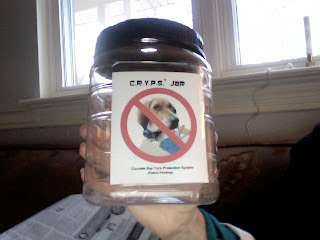 Since I have received these amazing C.R.Y.P.S., (I got two of them) I have knit a hat and a dishcloth. Not much, I know, but I was just testing the system. One of them works really well. I think the other one is broken. Everytime I try to use it, Ray comes by and tries to stick his tongue through the hole. Apparently, judging from the faint aroma that wafts out every time I open it, at one time this C.R.Y.P.S. was a peanut container. And, if you didn't know, like every dog, Ray loves peanuts.